The best way to get to know a community is by scheduling a tour. 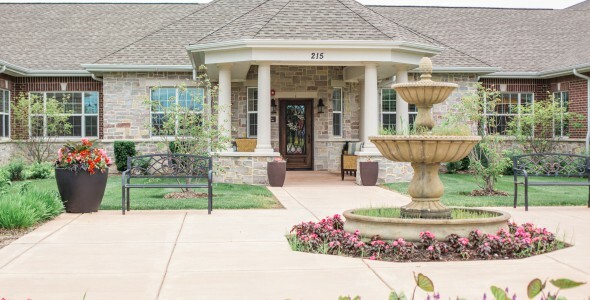 See the facilities, meet the staff and residents, and get a feel first hand what it's like to live at Autumn Leaves of South Barrington Memory Care. Chicagoland has numerous options for the treatment of Alzheimer's and dementia, but at Autumn Leaves of South Barrington, we believe our smart design and history of compassionate care sets us apart and creates a memory care experience that is second to none. At Autumn Leaves of South Barrington, the amenities we offer your loved one are just some of the things that set us apart from other memory care communities. Our building features spacious hallways and common areas bathed in natural light for the safety of our residents. We also have secured outdoor walking areas and a beautiful courtyard for more active seniors. Our intimate, homelike living areas encourage friendships and socialization. We understand options are important, which is why we provide several floor plans for private or companion apartments. We do not simply care for people with Alzheimer's and dementia at Autumn Leaves of South Barrington, we nurture them with comprehensive, personalized care in our Life Enhancement program. Each member of our nursing staff has received in-depth training in memory care, and that training continues the entire time they are employed here. Even our non-care staff has been trained in memory care to ensure resident safety at all times. Daily chores will no longer be an issue for residents of Autumn Hills. We provide three nutritious, homemade meals a day. Laundry, housekeeping and linen services are all taken care of by our staff. We also have a full-service beauty and barber salon. Our residents are our primary concern at Autumn Leaves of South Barrington, and we would love to tell you about all we have to offer.